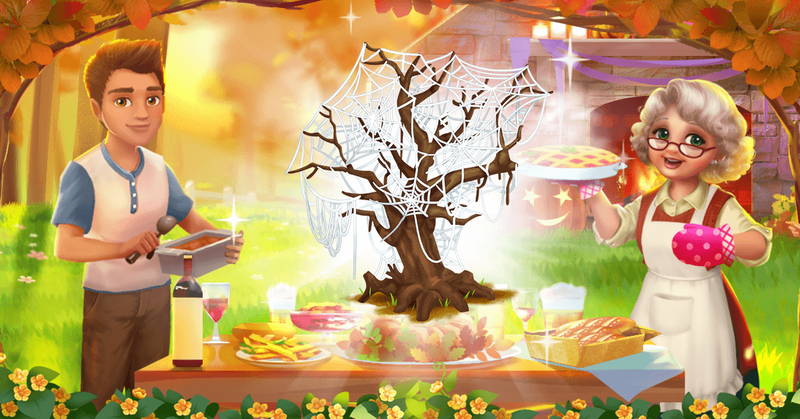 Help the farm members finish missions, and collect Jack-O-Lantern to trade them for amazing rewards! 1. Hiya farmer!Toby and I are hosting our first Family Dinner together. The only problem is I’m also puppy-sitting my friend’s litter of pups. I need to keep an eye on them can you help plant some things? 2. We’re hosting dinner at Toby’s house this time to give Granny a break. Toby lives on a beautiful farm too; everything tonight will be made from what Toby has grown on his land! 3. Toby’s made all the appies AND he’s set up the drink station! We just need a few more things from the store! Since the puppies are asleep, let’s slip out and get the food now! 4. All we need is flour, fruit and some more jars of Jam…oooh and some party favours while we’re at it! I can’t wait for everyone to see how well we can put on a dinner party! 5. We’re back at Toby’s place…Can you help with the groceries farmer? OOOH NOO! The puppies ate EVERYTHING! There are food scraps EVERYWHERE! It’s a DISASTER in here! 6. But how could I be mad at the pups. Look at them, jam and crumbs all stuck in their furry faces. Well, like Granny always says; ‘when life gives you lemons, make lemonade’. 7. In other words, since we can’t have dinner inside as planned, we can have it outside! It’ll be great! We’ll eat among the fruit trees, and rolling hills. 8. We can decorate the place with candles, leaves and of course, we’ll have all of our beautiful desserts on display! We don’t have much time though, can you help farmer? 9. Oopsies, I almost forgot to make the Berries n’ Grape Fruit Crisp! That’s the last thing to make and then everyone should be here…and not a moment too soon! 10. Here they are now and how sweet! Darryl and Tasha make Oatmeal Cookies to share! I sure hope they didn’t lick all the baking spoons like they normally do! 11. Hooray, everyone’s here now, bon appetite farmer! They’re all super impressed with our outdoor autumn dinner experience…even Mom and Granny! 12. Hehe, if only they knew the true story! That’ll have to be our little secret. IF anyone asks farmer, there was no disasters, we planned it to be this way all along!